Normal and abnormal movements in sleep have been a source of both great academic interest and clinical confusion. Nocturnal head banging (jactatio capitis nocturna) was one of the earliest-described sleep-related movement disorders, having first been mentioned in 1811. Since Manoia’s initial classification of abnormal movements in sleep as a separate category of sleep disturbances 90 years ago, a lot of progress has been made in the field. Several investigators have contributed to our understanding of these phenomena, which include rhythmic movements in sleep, hypnic jerks, propriospinal myoclonus, periodic limb movements in sleep, catathrenia, and phasic muscle movements in rapid eye movement (REM) sleep. 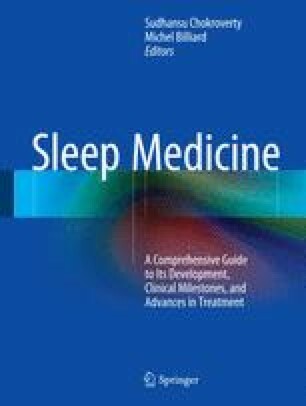 This chapter provides a brief chronological account of discoveries and research in the field of sleep-related movement disorders.